Olivier Blanchard is a global business consultant specializing in brand strategy, marketing management, social business integration, consumer insights management, and change management. He helps companies and their strategic partners understand how to develop effective digital strategies, properly deploy social business capabilities across their organizations, and align their programs to business goals and objectives. Though based in the US, his geographic range extends beyond North America to Europe, Latin America, the Middle East and Asia. He is the author of the #1 social business desk reference for digital managers and business executives: Social Media ROI: Managing and Measuring Social Media Efforts In Your Organization (Que/Pearson). 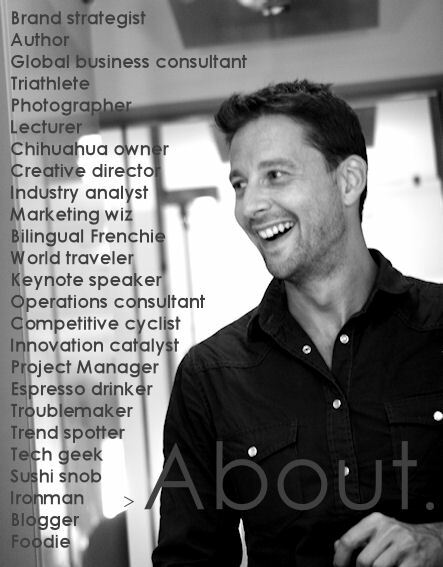 Olivier is also a sought-after keynote speaker and corporate trainer. Internationally, he has worked with IIR (Middle East); ADMA (Australia); iab, Sanoma Media, WDM Belgium, Best Of Publishing, i-SCOOP, FusionMex, LikeMinds, EDC London (Europe); InterLat Group (Latin America); and CEGN and the Fondation de Gaspé Beaubien (Canada). In the United States, he has delivered trainings and/or keynotes for PRSA, Jive Software, MIMA, Dachis Group, Stemtech, the Federal Reserve System, the Centers for Disease Control, the University of North Carolina, Clemson University, Loyola University, Design Centers International, as well as conferences and events too numerous to list here. He has also worked with national and global brands, among which are Microsoft, Adobe, Verizon, Hincapie Sportswear, Americas Mart, K2 Sports, Tickr, Bacardi, Raytheon, Corante, Smartbrief, Lexis Nexis, Intercontinental Hotels Group and General Mills. Prior to moving full time into consulting, Olivier spent 15 years working in product innovation, marketing management, business development and brand management. His extensive experience working with both B2B and B2C companies, managing projects and campaigns from both sides of the client-agency dynamic, and his understanding of international markets both contributed to his unique breadth of operational expertise and formed the foundations of his consulting practice. Olivier holds an International Baccalaureate degree from the International School of Brussels and a BA in Political Science from Furman University. He is a decorated veteran of the Fusiliers Marins (French Navy Marines), with whom he served as an officer before moving permanently to the United States. He is an avid endurance athlete, photographer, blogger and writer. When he isn’t working or traveling (hey, it happens), you will probably find him training for his next triathlon or cycling adventure. In addition to Social Media ROI (and its upcoming follow-ups), Olivier has been blogging for years. His blog (The BrandBuilder Blog) now lives here, although it has gone through a few long-overdue changes. You can check out the complete feed here or choose between one of three categories: Business, Lifestyle, and Writing. Happy reading.